Himeji Castle (姫路城 Himeji-jō) is a hilltop Japanese castle located in the city of Himeji. It is also known as “White Heron Castle” because of its white exterior. The castle is both a national treasure and a world heritage site. Furthermore, it was never destroyed by war or fire and is one of Japan’s twelve original castles. If these reasons are not enough for you to put Himeji on your Japan Bucketlist, I hope my beautiful photos will convince you. Going to Himeji was a right decision this time. It is stunningly beautiful and I couldn’t get enough of it. I hope to be able to see all the other original castles in the future. The exterior is stunning. The castle is empty inside though. I wish we could see what it looked like when it was used, but there are not even pictures. 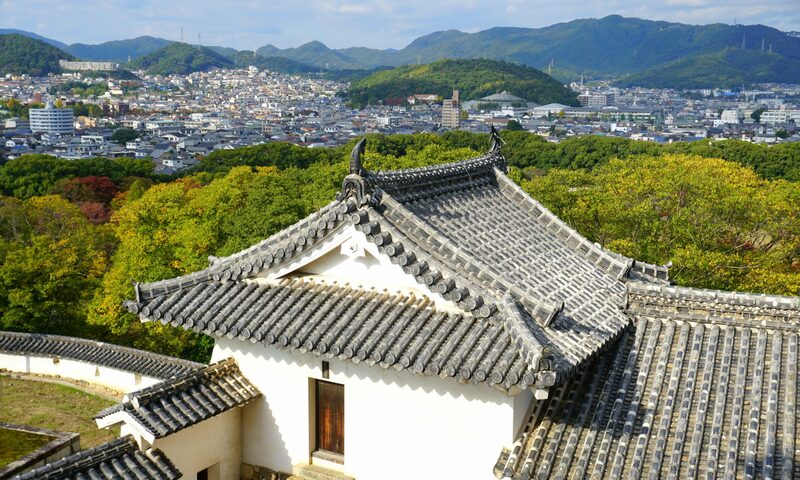 It is still worth to go inside and go up, because the view of Himeji City from the top of the castle is breathtaking. You also get to see the rooftop decorations up-close. After visiting Himeji Castle, we went to the nearby Koko-en Garden (好古園 Kōko-en). Koko-en Garden includes 9 different gardens and it is a pity that there was nothing blooming in the flower garden when we went there. I do think it looks most beautiful in spring and during the summer, but even in late autumn we couldn’t help but fall in love with Japanese landscaping aesthetics.